In the late summer of 2014 my experienced hiking buddy, designer Dave Funk, and I parked his SUV at a trail head in Oregon’s Three Sisters Wilderness. We were headed to Black Crater Lake for three days of backpacking and hiking in the beautiful Cascades. Dave had good maps, a compass, a natural feel for the terrain and a sense of where the lake was supposed to be. After an hour on the trail, the weather turned. Darkened skies preceded a steady slow downpour that would not let up for the duration of the trip. We donned rain gear and soldiered on, with our dripping forty-pound packs. At some point, we decided that the trail was too slow and circuitous and that a more direct crow-fly route would get us there quicker, so off-trail we went with the compass as our guide. But in the darkening gloom we soon could not match the compass to the map—no peaks or visible features to find on the map, essential to compass reconnoitering and wayfinding in general. We came across an annoying metallic party balloon tangled in a tree as we headed straight west. We cursed it as a tacky and environmentally unfriendly artifact, defacing the pristine Oregon woods. Knowing the sizable lake was westerly we hiked on, crossing a series of small heavily wooded rises and low hills. On we went. Dave was confident that we’d hit the lake eventually. I was thinking, what if we’re off a few degrees and pass right by it? He was right, but it took much longer that either of us thought it should have. We were so happy to find the lake in the rain that neither of us thought about the daunting task of hiking back to the car—we had not arrived by trail and would therefore need to find where the trail hit the lake (not easy) or bushwhack our way back with compass and intuition. After a couple very soggy days we voted to head back—it was unanimous. That’s when the trouble began. In bound, heading west to a big lake was pretty good odds; conversely, going the other direction hoping to run into a small car was a different can of worms. 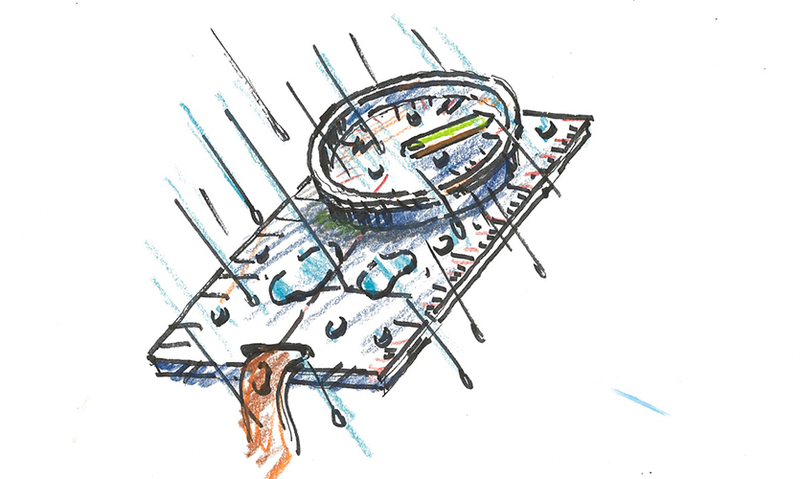 Even with the compass we got disoriented almost immediately and fell into a rain-soaked wander. I’ve never been fearful in the woods but sensing Dave’s growing unease, I began to worry. The small rises began to look similar—were we making a big curving route? Or had we even doubled back in confusion? Was the car still to the East? Or had we already overshot it and into Cascades oblivion? Just when we (me, mainly) became very worried, we crested a rise and there was that damn balloon, bobbing in a pine tree below, signaling our location and proximity to the trail. All was suddenly well, and we made the car in an hour in a classic example of orientation and wayfinding by icon. Could be a church steeple in an Austrian town, a Shell station in Iowa, a blue wall in a hospital or a castle in a theme park. It can even be a foil balloon in the forest—we orient and navigate by means of distinct and memorable icons.